One-piece dress of white, red, and black wool jersey by Racine. 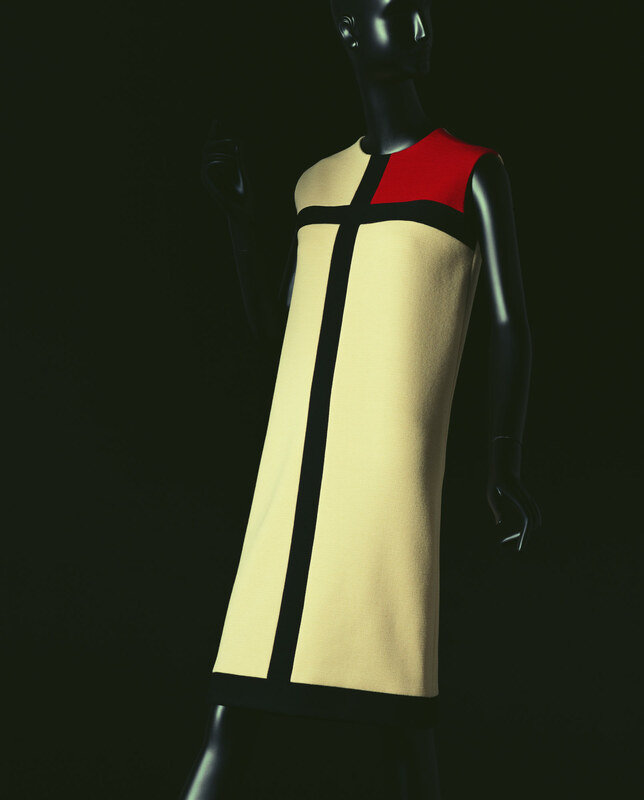 This dress is a masterpiece by Yves Saint-Laurent, a leading designer of the 20th century. A straight A-line dress with boldly set primary colors, bordered by black straight lines, was created after "Compositions," famous paintings by the Dutch painter Piet Mondrian (1872–1944). The abstract painting, composed of separate blocks of white, red and black on the canvas, could be applied directly to the dress by set up with jersey pieces woven by the Racine machine. Although the form is very simple, the body lines of the woman who wears it loom out in subtle. We can glimpse the highly sophisticated cutting techniques of Haute Couture designers. Saint-Laurent was known as an art collector. "Compositions" was in his possession as well. After quitting from Christian Dior, Saint-Laurent launched his own fashion house in 1961, when he was only 25 years old. During the period when haute couture competed with the emerging prêt-a-porter and fashion trends were shifting, Saint-Laurent found out precisely what was required by the new age and released novel designs. In 1966, the year following the presentation of this dress, he opened a prêt-a-porter boutique in the left banks of Paris. He gained worldwide popularity with new elegance that matched everyday lives, such as A-line mini dresses and pants, and led the fashion trends in the late 20th century.